Black Dog & Leventhal, 9781579128678, 96pp. The newest book in Black Dog's best-selling, award-winning series explores the fascinating world of Greek mythology from the myth of Narcissus to Odysseus versus the Cyclopes. Includes a Gods and Goddesses Family Tree Poster and Stickers! Packed with action, adventure, tragedy, and triumph, A Child'sIntroduction to Greek Mythology acquaints kids ages 9–12 with all the fantastic and memorable classic Greek myths. The book is organized into two main parts. The first section introduces the gods and goddesses, from Apollo to Hades, as well as nymphs, satyrs, centaurs, and the mortal descendents of Zeus, such as Hercules and Midas. Part two is dedicated to the myths themselves: Pandora's Box, Prometheus' Discovery of Fire, the Trojan Horse and many more. Sidebars feature word definitions and fun facts, as well as games and projects. As with all of the other books in the Child's Introduction series, Meredith Hamilton's witty and charming illustrations add yet another dimension to the excellent and absorbing text. 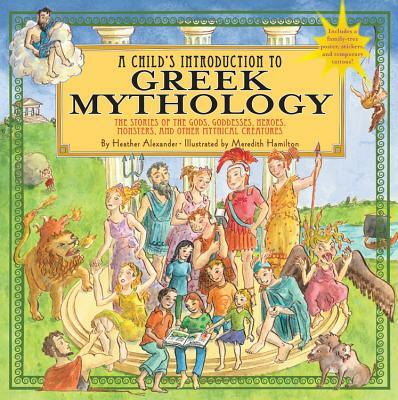 Heather Alexander has written numerous books for children and young adults including previous titles in this series, A Child's Introduction to the World and A Child's Introduction to Greek Mythology. She is a former children's book editor and lives in Basking Ridge, New Jersey. Meredith Hamilton graduated from Brown University and has an MFA from the School of Visual Arts. Formerly an art director at Newsweek and Time, she illustrated the previous six books in the Child's Introduction series, among other books, and her work can be found in magazines and animations as well. She lives in Brooklyn, New York, with her husband and three children.